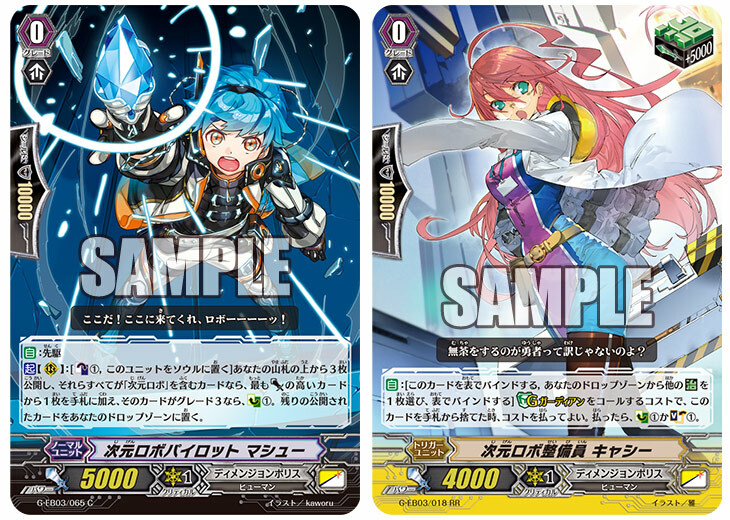 Specifically Blau and Dimension Robo support cards. CONT (RC): During your turn, if the number of cards in your Damage Zone are equal to or greater than the number of cards in your opponent’s Damage Zone, this Unit gains Power+2000. ACT (RC) 1/Turn Generation Break 1: [Counter Blast 1] Reveal the top card of your Deck, place it face-down into your Damage Zone. If you place a “Blau” card, during that turn, this Unit gains Power+5000, and when that turn ends, choose 1 card from your Damage Zone, Heal it. Auto: [Bind this card face-up & Choose 1 other Heal Trigger in your Drop Zone, Bind it face-up] When this card is discarded from the hand for the Cost of Calling a G Guardian, you can pay the cost. If you pay it, Counter Charge 1 OR Soul Charge 1.